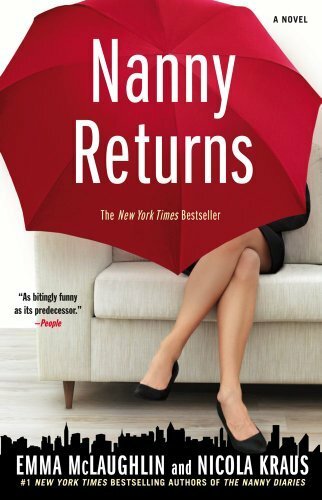 After reading The Nanny Diaries, I was expecting much of the same light-hearted yet surprisingly thoughtful and deep writing that defined Diaries to feature in Nanny Returns. In other words, the first novel was fun, interesting, and addicting while still not feeling like too much of a guilty pleasure (unlike certain “beach reads” I’ve read)! Nanny Returns, however, takes a bit of the enjoyment out of Nan’s story and deals too much in serious topics that seem to jade our previously idealistic and inspiring narrator. The writing in this second effort still offers a perspective into the privileged lives on NYC’s upper class through the eyes of a grounded and empathetic narrator, but the novel as a whole felt a bit heavy – even slightly depressing. The authors’ intent was to show the shallowness and corruption of the upper echelon, and they do a good job of this, but I definitely would not call it escapism fiction or a breezy, trendy, or particularly fun take on NYC high society. In a way, that’s a compliment – I think McLaughlin and Kraus do a fine job of writing with substance and depth. However, this means they sacrifice a bit of the humor and joy that was felt throughout the first outing with Nan and Greyson, her young charge. Nan seems weighted down with the cares of the world this time around, and this is reflected in her observations and reactions. Obviously, a bit of level-headedness is often nice in a narrator, but I most appreciate when that gravity is mixed with levity and joy, and this seemed to be lacking, especially compared to the first go-round. Nan works in private education, which is an interesting element for me as I read this novel while teaching at a private school; the authors get a lot of the details right, but the portrait of the administrator seems to be a bit unbelievable. Sadly, the way he handles a certain situation with a teacher probably occurs in schools like Nan’s, but in my experience in private education (4 years at several schools), this incident would probably be dealt with much differently. Aside from the somber mood and the stretching of believability in some aspects, I still feel this could be a worthwhile read if taken in the right manner – it’s going to be a bit more serious than one might anticipate, and Nan has not necessarily changed for the better – I miss her idealism and brightness from the first novel. My copy of the book had a cover that seemed to evoke a feeling of light-hearted fun, but overall, this novel was far more pensive, realistic, and serious in tone, even while featuring a cast of characters not super relatable – these factors are what perhaps leaves the reader a bit cold.